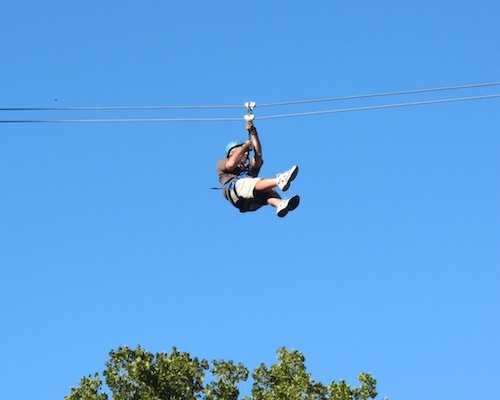 Soar (screaming) across the Meramec River way above the treetops on this high-adrenaline, extreme adventure. Your ticket includes three swinging sky-bridges and four zip-rides from 200 feet to 1,250 feet long and reaching speeds of 50 mph. 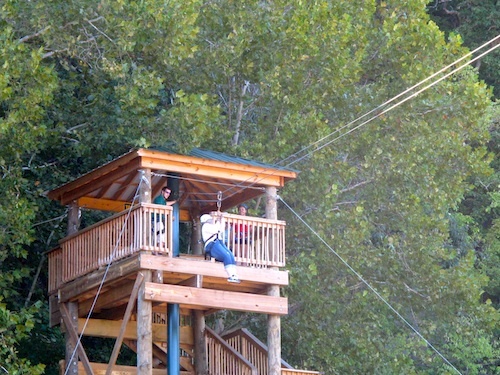 Have no fear, because trained instructors will lead participants on a canopy tour lasting about one hour. All necessary safety equipment is included. Requirements/Restrictions – Reservations are required. Participants must at least 10 years of age, weigh at least 80lbs, and cannot exceed 270 lbs. Participants must be in good health, no recent surgeries/procedures, and cannot be pregnant. Zip over the Meramac River and above the tree tops. Photo Jeff Hobson. Arrive at least 30 minutes prior to your scheduled tour time. This will give you enough time to check-in, fill out necessary paper work and prepare for your tour. Zippy Celebrations: Scream through your next birthday and BYOC. The group rate of $25 per person will be issued for groups of 10 or more to celebrate special occasions such as birthday celebrations. Both indoor and outdoor seating facilities are available for accommodating groups, per request. A restaurant is on site offering a full menu selection (including sandwiches, pizza, and etc. ), along with a snack bar, and ice cream. You are welcome to BYOC (bring your own cake). The restaurant has 28 flavors of ice cream! The restaurant serves home style cooking and includes a snack bar. It can seat up to 250 people and also hosts an elegant private dining room. Schedule special family reunions, birthday parties, company gatherings here. The restaurant can also cater outdoor picnics, Bar-B-Que, and box lunches. 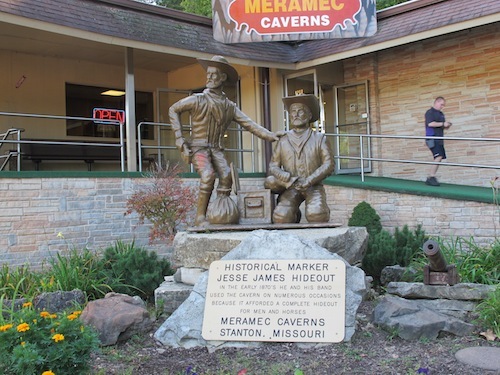 Also onsite: Caveman Zipline, Cavern Canoe And Raft Rentals and Jesse James Wax Museum. Open March-October. Tickets: Adults $49, Children (ages 10-12) $39, and Active Military $39. Reservations are required. For up-to-date information about St. Louis, call the St. Louis Convention & Visitors Commission at 1-800-916-0040.